I recently attended a class at Mat-Su college titled "Edible Wild Greens." We went over a lot of the plants and berries available for harvest and consumption in the Valley. 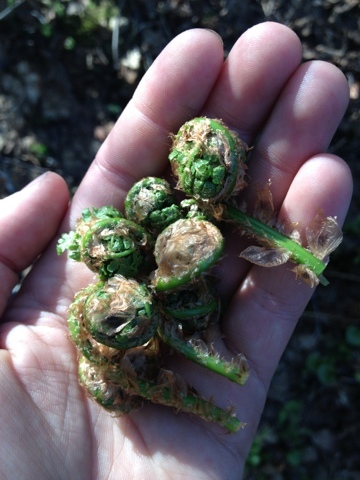 Most of the plants---such as fiddleheads--- are only edible if picked as new growths in the springtime. 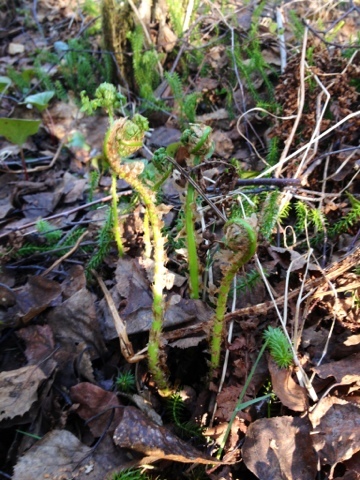 Poking around the woods the other day, I came across a small field of fiddleheads on the upper banks of Lily Creek. 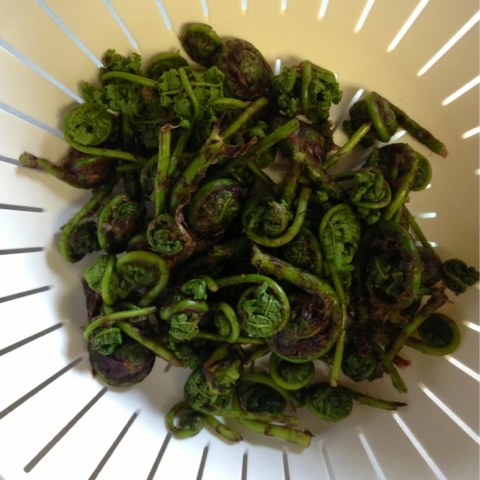 I've never eaten fiddleheads before, so I picked a small amount and planned to cook them up as a side dish for that night's supper with Grandma. I washed them, dried them and sautéed them up in a little olive oil until tender. We ate them with chicken and au gratin potatoes. And...? I was unimpressed and a little disappointed. They were more bitter than I expected and certainly did not match up with the rave reviews the plant ladies at the Wild Edibles class gave them. These ladies were practically drooling just talking about eating these things. Maybe I should have fried them in butter? Well.... after a little bit of research, I determined the fiddleheads I collected were Ostrich Ferns AND I did not prepare them properly, which might account for the taste. The brown papery covering on the plants was to be removed---something I did not do. The fiddleheads were certainly edible---but I found them more tasty when covered in cheese sauce than not. And I LOVE green things---asparagus, brussel sprouts, etc. etc. So, I'll go scouting for more fiddleheads the next time I'm out and give them another go. I found this page: http://plants.alaska.gov/publications/pdf/Fiddleheads.pdf helpful in identifying my fiddleheads. There are quite a few good books on edible wild plants in Alaska; I plan on ordering a few. 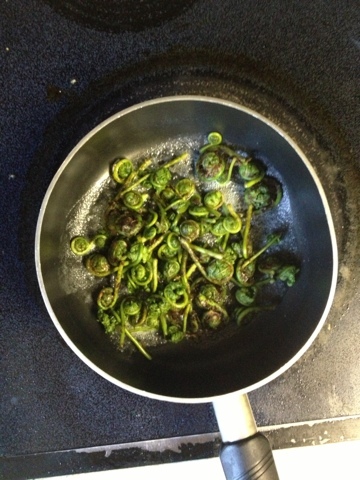 Hi Lisbet, I was laughing at your fiddleheads post as my ex used to love them! I tried them once but didn't really like them, wish I did as I think it's nice to be able to eat wild plants, I don't live in Canada anymore and I don't think we have them here in Northern Ireland, all the best! haha i know, i was given the impression they were super tasty !